Since the birth of the car at the end of the nineteenth century, cars have been a great passion in the De Angelis family. My grandfather and his brothers were founders of the local Automobil Club of Italy in our hometown of Ascoli Piceno. My father Francesco (born in 1923), and his brothers Vito (born in 1920) and Vincenzo (born in 1925) retained this interest in motoring and continued their pursuits in automobiles and racing cars. 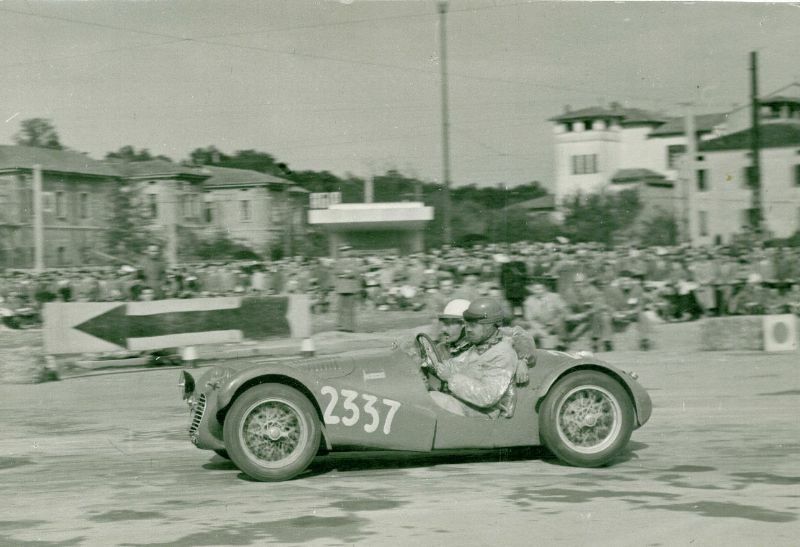 In 1952 Francesco and Vincenzo began racing cars all around Italy, and entered that year’s Mille Miglia with a little Fiat 500 named Topolino. They finished in 228th place and 4th in class. 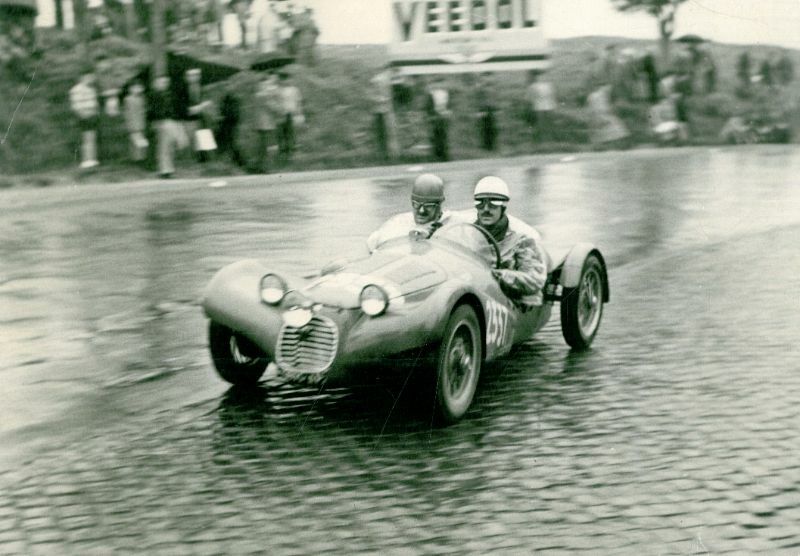 The brothers also competed in the 1954 Mille Miglia (and other races) in the same Topolino. 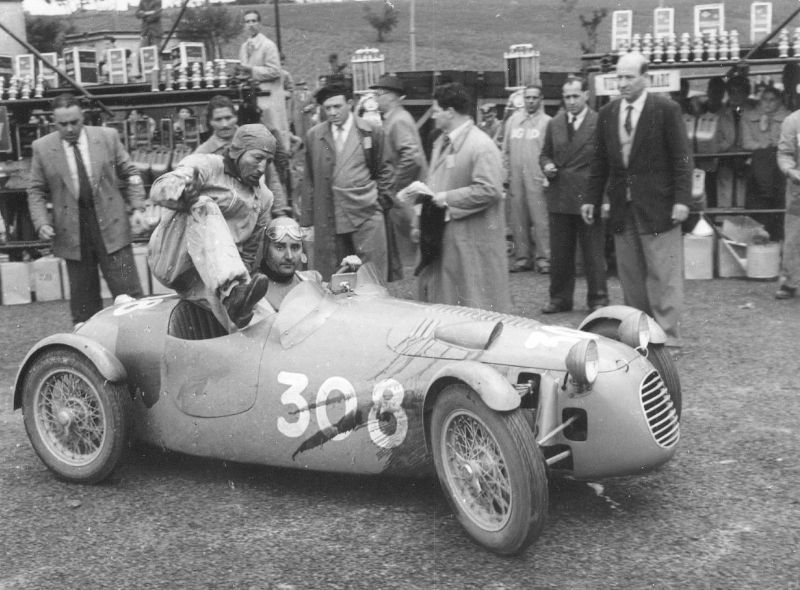 The 1954 Mille Miglia saw the debut of a true racing car – the Giaur-Taraschi chassis BT004 and engine Giannini G1–085. This car was built by Taraschi in Teramo (close to Ascoli Piceno) during 1949 and 1950 before being sold new to Italo Arlini-Di Brigida from Pineto with licence plate TE 6004. He then ran the 1950 Mille Miglia with this car and then sold it in Grottammare (Ascoli Piceno) to Mario Gustavo Laureati in 1951. 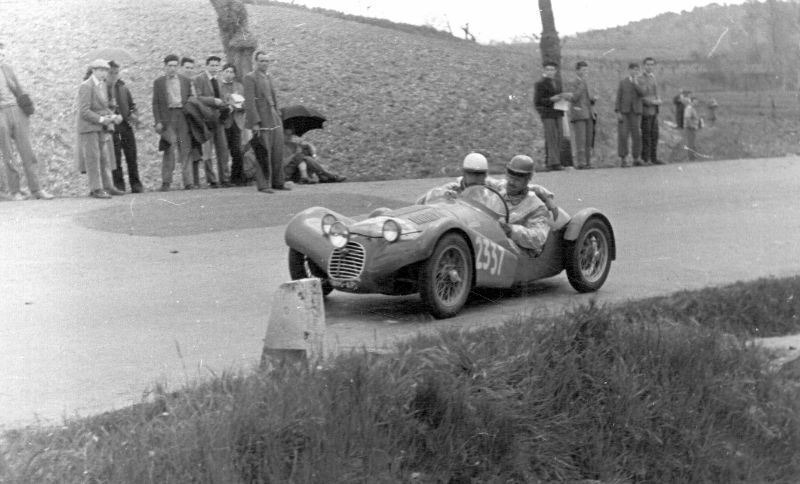 In the Giaur, Laureati ran the 1951 running of the Mille Miglia with Elio Celani from S. Benedetto del Tronto, and again in 1953 with Amedeo Francescangeli from Ascoli Piceno to finish 161st overall and 11th in class. It was then that my father Francesco finally bought the car. 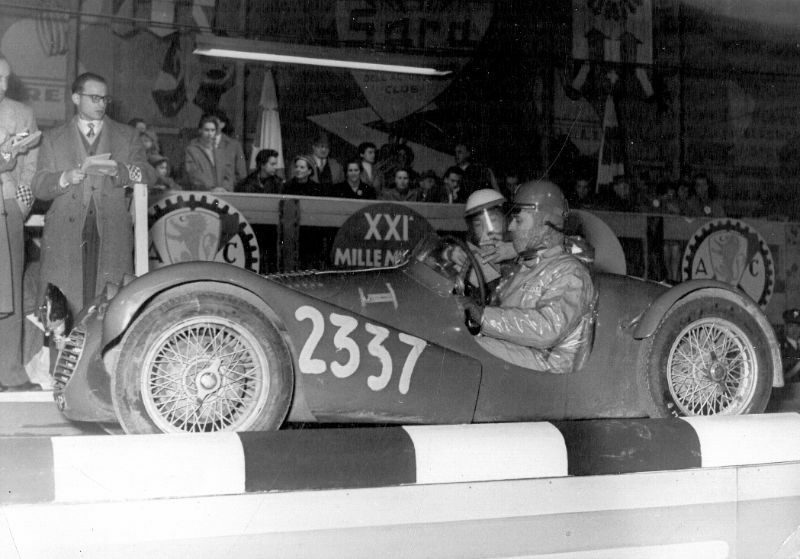 My father soon raced the Giaur at Circuito di Macerata with race-number 24, finishing 3rd, then in the 1954 Mille Miglia, where he finished 156th overall and 12th in class. He actively campaigned the car, racing at Circuito di Salerno, Circuito di Terni, Vermicino-Rocca di Papa Hillclimb and other events. 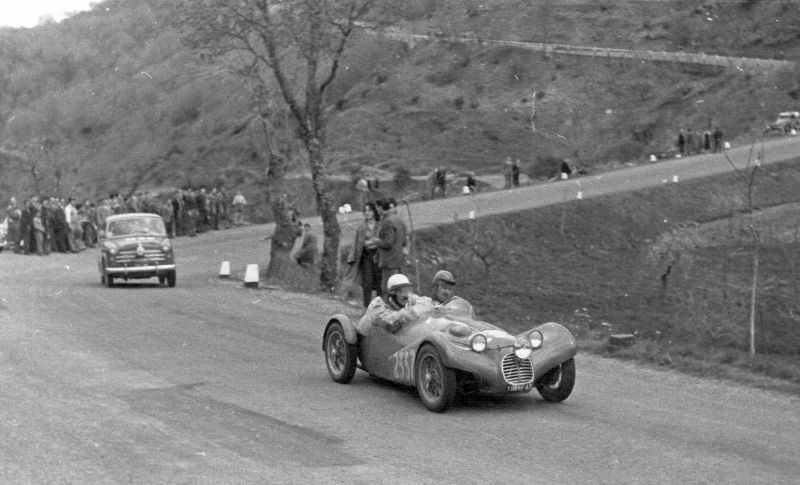 Then the car sat for much of 1955, as he drove a Fiat 1100 TV at the Mille Miglia. As usual, he drove with his brother Vincenzo, but a broken transmission prevented them from finishing. Then, at the end of 1955 he traded the Giaur for an Alfa Romeo 1900 with Alfredo Tinazzo, a fine driver who later raced the Giaur in the 1956 and 1957 running of the Mille Miglia. In 1959, Tinazzo sadly died in a race at Monza. My family had always believed that Tinazzo was actually driving the Giaur at Monza, and therefore thought that it had been destroyed. Beautiful story, beautiful car congratulations Giuseppe! Nel 1959 mi trovavo a Monza .Rimasi molto colpito dall’incidente di Tinazzo e Crivellari,le cui auto si agganciarono a 160 km/h alla curva Ascari.Ho ancora presente l’immagine della camera ardente presso l’ospedale di Monza con i 2 piloti affiancati nelle loro tute azzurre.La fine di un sogno. Fantastic Giuseppe, I would hope to see it in Historic racing, in not only Italy, but in Europe as a whole, this car is to good to just be used on fine days and Sundays. I´m sure your Father would have agreed. Congratulations on a story well written. Wow now that’s my kind of car story! Fantastic, thank you. Fantastic story, and I can imagine how would have felt once you discovered the car after 57 years! Bravo! Bravo! Never give up the memories of these old cars and their meaning. A heartwarming story, thank you for sharing this. It would also be wonderful if this little car could visit the US and be driven at Monterey or be shown at Pebble Beach or Concorso. What a pedigree! Amazing story & well done for tracking down your Fathers race car. Buongiono Luigi, mi incurisisce sapere che eri a Monza in quel tempo…..spettatore….pilota….che altro? Conoscevi Tinazzo e Crivellari? Hello Graham!!! I hope to tour the world with the car!! Ha perfettamente ragione, è quello che mi succede ogni volta che la vedo e non solo quando ci cammino. Mi venga a trovare ad Ascoli Piceno se capita da queste parti oppure mi faccia sapere dove poterla contattare in caso di raduni e altro. Caro Giuseppe, io purtroppo non vengo spesso in Italia, faccio spola tra´Sud America e Stati Uniti dove ho lavorato per molti anni. Con mia moglie si verra´in Europa, Inghilterra dove lavora mio figlio maggiore ´´ senior aerodinimicist con la Mercedes Benz di Formula Uno, che se tutto va´bene e questo prechiamo il Signore, ci regalera´il nostro primo nipote prima di Natale. vitoorsini@yahoo.com se mi manda le Sue coordinate, come detto anzi, mi farebbe piacere almeno sedermi per un minuto sulla Sua macchina. Tante belle cose a Lei ed i suoi cari. Gracie Giuseppe – since de Praedicat “de” denotes aristocracy, I thought we were talking about the same family. I take this opportunity to remember Elio, a great credit to the F-1 circuit in his time. He died way too soon. ok Giuseppe, I saw in the picturers that is fully restored, I hope that you have a lot of fun driving it, and would like to see you in the next migle millie. siau bello. Wonderful and heartfelt story. Having owned a Giaur for nearly 40 years I can tell you there is something magical about those little cars. They inspire adventure, much like the makers who were so motivated to go racing. Congrats on the find and I hope you have many years of joyful adventures. glad to hear about that phantastic story, which finally came to a happy end. In the sense of an true motorist it must be a wonderful feeling to bring such precious family piece back. never heard about that make. I would love to receive more technical details. Thank you and congratulations.